I'm working on a project to allow me to wirelesssly measure and log the temperatures in a building. I want to build an accurate picture of how the temperature varies from room to room and over time. The information gained can then be used to optimise the heating system. I'm looking at various options to accomplish this from simple dumb sensors with a transmitter or a cheap microcontroller like the Arduino to full wifi enabled microcomputer systems like the Raspberry Pi. Whatever I choose for the remote hardware it will need to be cheap to produce and low power enough to operate for several days at least on battery. I'm going to take advantage of the fact that I only need to record temperature every 10 minutes or more to minimise the average current consumption. To do this I need a low power, long time delay circuit to wake up the logger at regular intervals, take readings and transmit the data to a base station. The obvious place to look first when in need of a timing circuit is the 555 timer chip. It's been aroound almost as long as I can remember but it still manages to impress me with it's capabilities. The standard 555 IC has a low power consumption. I measured the current that one in-circuit 555 used at 8mA. This doesn't sound much but if you run the device off a 2000 mAH battery then it can only be expected to work for 10 days. This may be enough but this has to be put together with the power used by the datalogger when it's turned on for say 1 minute out of 10. If the logger takes 200mA when powered up then this is equivalent to 20mA continuous. With an average current of 28mA the battery will only last for less than 3 days. If the timer power could be reduced to zero then the battery would last 30% longer. The standard 555 chip takes 8mA but there is a low power CMOS version of the 555 which requires significantly less power to operate. I don't have any low power versions but I do have a standard one so I'm going to start testing that until I can get my hands on a low power version. The 555 can be used in a number of different ways to produce square waves, pulses or simple one shot timing. I need a one shot timer that can energise the datalogger after a delay and be reset by the datalogger after it has performed the task. I began by testing the 555 in some conventional circuits and I was easily able to achieve repeatable delays of several minutes. I want longer delays. I want to have a delay that I can set from 10 minutes to a few hours. I could use a 555 to generate a 1 second or slower pulse which I then feed into a counter to produce long and accurate delays but that seemed a bit of overkill. 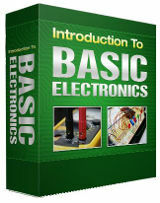 That was when I found a simple variation on the basic circuit. I don't need the delay to be particularly accurate because I will need to log the time of the reading anyway. It doesn't matter whether I take readings every 8 minutes of every 12 minutes apart from the impact on the battery life of course. Anyway the circuit above seems to do just nicely. I'm sure that this circuit will do even longer time delays stretching into days if required but once every 90 minutes is the longest I shall need for my datalogger. Now where is that low power version? Why use 555 when you can use attiny? In sleep mode it runs on microamps. Timer interupt can wake it after specified time and put it back to sleep after logging is done. How to generate 22 hours Delay using 555 timers? How to generate a 1 minute pulse with 30 mins delay? Will it automatically repeat the cycle? Or it has to be reset manually. You'll want to use a small micro. 555s waste too much power for your application - and you're going to have to record the data anyway, so why not use a micro controller and write to a memory card that you can just plug in and read later? The Atmel line offers processors with "pico power" operation. You can set a watchdog timer to wake up every 8 seconds or so. In this mode, the average power consumption is on the order of half a MICRO amp (about 1000 times less than your 555). When the watchdog timer times out, it jumps to an ISR that can do whatever you like. Some Atmel processors have on-board temperature sensors, and you can use that, or if you want to use an external sensor, that's easy enough to do. Read the data, write it to your memory card and go back to sleep. If you want one read every 10 minutes, you just decrement a counter which keeps track of the number of times the watchdog has timed out. So at 8 seconds, you just count down from about 75 and when you hit zero, take a reading. Of course, the processor will consume more power during the count/sense/write cycle, but it's still only on the order of a fraction of a mA, and it's only for a tiny fraction of a second. The processors cost about a buck a pop and are available in 8-pin dip packages (which makes it really easy to mount them to a board). Other manufacturers may have similar products. I just happen to be familiar with Atmel. With an energy budget of 2000maH (assuming 3.3-5 volts), your logger should be able to record data for well over a year on a single battery. Thanks for your guide. I'm looking for a long timer with a 1 second pulse at the end to start a washing machine. Is it likely that I could extend the delay to around 4-5 hours using your method above? Yes I'm sure that you can get a longer time delay from this circuit. I haven't tested it because it takes too long to do the test. Try using a value of 820kO for RT or increase the value of the capacitor to 220uF and use 390kO for RT. Both the above RC combinations should give you a delay of approximately 5 hours. 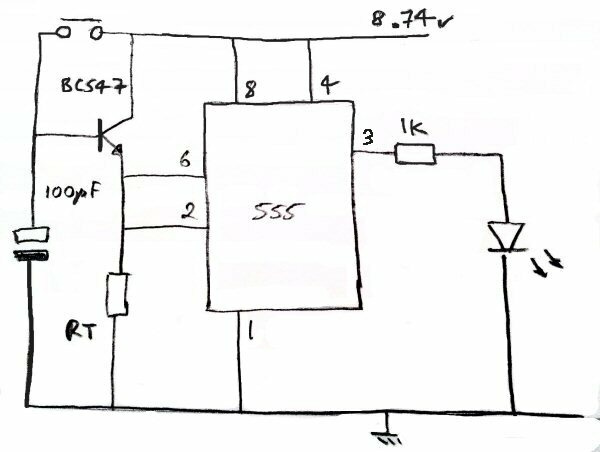 To generate a 1 second pulse after 5 hours you will need to follow the circuit with another 555 circuit configured to give you a 1 second pulse when the output from the first 555 changes state. How can I increase the time delay sir..
12 hours time cycle sir....how can I use the R1 value.. I waiting for your valuable response sir...share on e-mail sir..
Actually, there's a practical limit on 555 timing circuits caused by the leakage current of capacitors. An IDEAL capacitor will hold a charge forever, but a practical capacitor always has a leakage current. This is especially true in electrolytic capacitors (which are probably what you'll be using to achieve high capacitance values). I've read the leakage of an electrolytic can be in the range of several µA. If you use a 100K resistor to charge the capacitor, the charge current will be within an order of magnitude of the leakage current. Since all of this can vary by an order of magnitude within a reasonable temperature range, you may wind up with a "timer" that isn't accurate. And if the charge current is LESS than the leakage current, your device will never toggle. The maximum reliable time interval for a 555 is probably less than 4 hours, depending on voltage, capacitor quality and value, and temperature. For extended accurate timing intervals, micro-controllers are the way to go, and for extreme intervals with reasonable accuracy (months with error ~ seconds) you might consider a dedicated timing circuit like a DS1307 or a micro-controller with an external crystal.